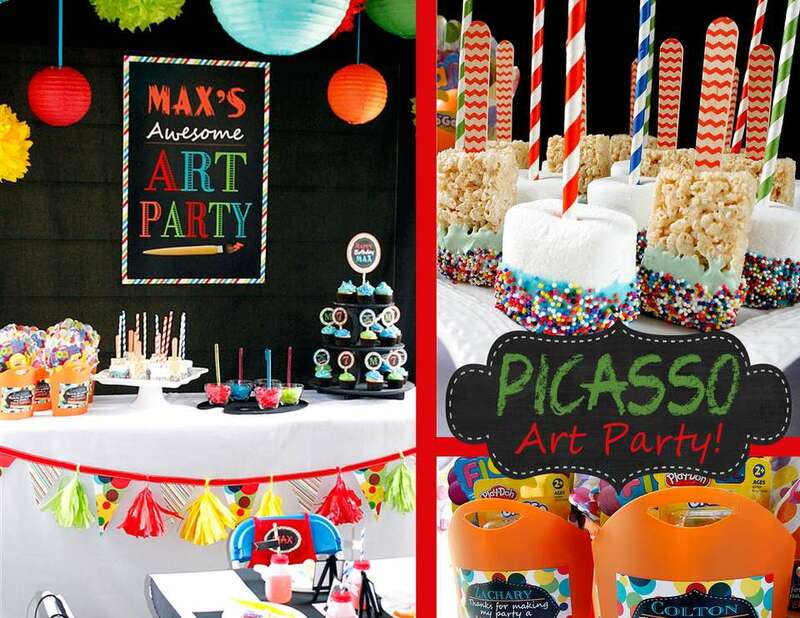 My son Max LOVES everything and anything to do with ART, so I knew exactly what we would do for his birthday theme...Max's Awesome Picasso Art Party! I decided to add the Picasso twist because what's more fun than abstract art! 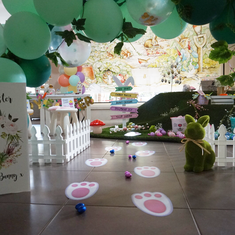 The party was a blast to design and execute...and Max and his friends had so much fun creating fabulous art. I definitely wanted the theme to have a boyish feel so I incorporated a black chalkboard throughout the design with a rainbow of awesome colors. I started off by designing the invitation and the party printables like cupcake toppers, favor tags and straw flags. The dessert table was an explosion of color! I hung about 15 colorful tissue balls and paper lanterns in all different sizes from the ceiling. For the backdrop I used a simple black tablecloth and designed a super fun poster that I simply hung in the middle. 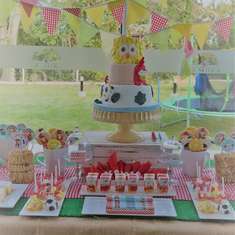 I kept the dessert table fairly simple with some fabulous cupcakes, chocolate dipped giant marshmallows, rice krispy treat pops and awesome party favors. 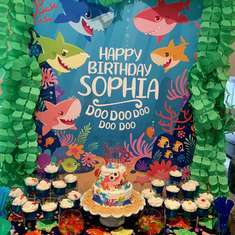 The finishing touch for the table was the fun and colorful tissue tassel and pendant banner that hung across the front of the table. Upon arriving, each child received a personalized apron. I found these great aprons at Hobby Lobby and used iron on printer paper to print my design onto. Then I simply cut out the oval shape and ironed it on! Next, we made Picasso Pops! These were so much fun to make. I got Jolly Rancher candies and broke them up into little pieces. On top of wax paper, the kids created their masterpieces by making a design with the candy pieces. I then placed them in the oven for 6 minutes at 350'. Immediately after removal you need to add the lollypop stick and let them cool. Finally, we ended with Picasso Portraits! The kids all used chalk pastels and black construction paper and drew themselves in a fun and abstract way. All the kids had an absolute blast! 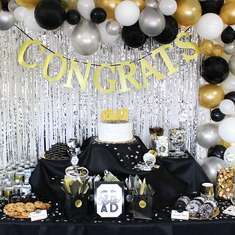 I hope you found a little inspiration for your next party! Check out these printables for sale on my ETSY shop! WHAt did you do for the pizza? love the card. where did you get it?